Three small-time criminals finally get the chance to climb the ladder - but manages to f@#% it all up in royal manners. The crazy fisher man Kurt Josef, an early pensioner, and his odd musical friend Rock Fjellstad has landed a job at Hurtigruta, only to discover that someone has killed off a famous artist, former M2M-member Marion Ravn. The third installment of the Børning-franchise. 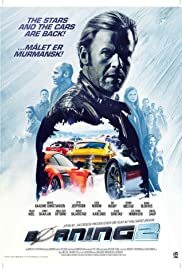 The first Børning-film's last scene promised that we cold expect a second coming on this Norwegian take on a The Cannonball Run, or Need for Speed. The first film was also a box office hit in native country Norway, with it's silly and down to earth humour. And this follow starts right where the first ends in all ways. Once again You'll get amazing driving scenes, this time in mid winter, driving from the western coast of Norway all the way through Sweden, Finland and into Murmansk in Russsia. The trip is decided by a dart toss, after a challenge is made. Our "hero" Roy is just out of prison after spending two years for illegal and reckless driving in the first film. He get's good words from traffic police man Philip Mørk, whom Roy promises to keep away from street racing. Roy gets off, starting his new job as a petrol station worker, when he realizes that his daughter has a car loving boy friend, ready to attend a the new street race. And when Roy's divorced wife realizes this there's no way this is acceptable. Once again the film is beautifully shot film, with great driving scenes, some quite spectacular, mixed with funny scenes and a kind of a cheesy dialog. This script is actually a tad better than for the first film. The persons we love from the first film is back, and so, I'm afraid, is the persons we learned to hate as well. The annoying daughter falls through once again in a scene when she starts crying, but all others does a a good job. A new comic hero is Roy's wife, Ingrid, played by Marie Blokhus, which is really hilarious as a frantic and desperate female. This film is once again going to be one of the biggest hits in Norway this year. This due to both good marketing, as well as a solid cast of well known Norwegian screen actors as well as a couple of comedians. No doubt they all had fun whilst filming! The cars this time is a just as broad mix as in the first film, but the film doesn't manages to give just such a fresh car driving impression as the first, neither the same great filming, nor scenic route. But the film is funnier, and serves better gags, weighing up for the weaknesses, and the film once again serves as good entertainment. If you are able not to take the film too serious, I guess this film will entertain those who love horsepower, loud engines, burn outs, drifting along side with testosterone, bickering, rivalry and stupidity, combined with real humans and real characters. The technical parts are great, and the CGI is top notch. Enjoy this "Norwegian winter Cannonball run"!